After President Lincoln was killed, the government shut down Ford’s Theatre and imprisoned owner John T. Ford for over a month. By the time he was released, arsonists had tried at least twice to burn the building down. When Ford announced plans to reopen the theater, he received so many threats that the government took over again, in the name of public safety, and decreed that it would never be a playhouse again. 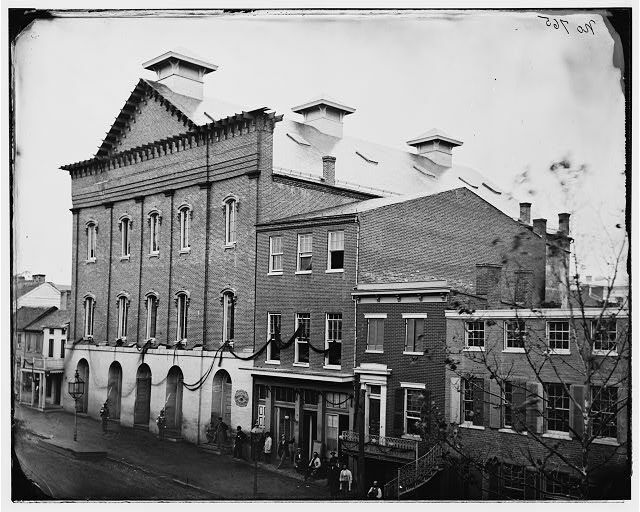 Ford’s Theatre in April 1865, after Lincoln’s assassination. Note the guards at the entrance and the crepe draped from the windows. By late November 1865, a little more than seven months after the assassination, the once beautiful theater had been defaced beyond recognition and relegated to a drab, three-floor office building. Ford’s Theatre was restored in the 1960s and is a working playhouse again—and a museum to both the assassination and the assassin. It’s well worth a trip if you’re ever in Washington.